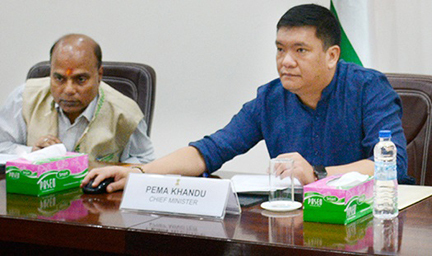 The Cabinet Committee on Infrastructure (CCI), under the chairmanship of Arunachal Pradesh chief minister Pema Khandu on Thursday cleared projects worth more than Rs 700 crore for the state. In a detailed discussion on infrastructural needs across Arunachal Pradesh, members consisting of deputy chief minister, Chowna Mein also minister in-charge of Planning, Finance and PWD, chief secretary Satya Gopal along with the commissioner finance, planning and investment and planning secretary took several major decisions after going through presentations by individual government departments. The CCI approved the proposal of constructing a Directorate Complex at Itanagar to house all directorates under one campus to increase efficiency, ensure security of government employees and also reduce unwarranted expenditure. The CCI also decided to allocate fund for creation of basic infrastructure for the newly created districts in the next budget. The CCI further directed the public works department to prepare a comprehensive road map for connecting all the urban centres and administrative headquarters in a phased manner in order to ensure that roads are constructed in a planned manner which results into optimum utilization of resources. Further it was also decided to restrict the contingency charges of project cost from the existing 3% to maximum 1.5 %. The cabinet also decided that in order to have a uniform system for revision of project costs, henceforth, all departments will submit such proposals to Planning Department which will get it vetted by a committee of chief engineers constituted by the government for the purpose. The CCI also took serious note of the fact that a major chunk of government’s resources are going for construction of retaining wall , protection wall, boundary wall which otherwise can be utilised in other critical infrastructure like schools, health centres, colleges, water supply, and electricity among others.